Photo, Tony Brock, Toronto Star, 2 Apr. 1995: C1. “If I hadn’t enjoyed cartooning so much, there’s no way I’d have taken that much rejection [of her strip by newspapers] and kept going.” Sandra Bell-Lundy, Toronto Star, 2 Apr. 1995: C1. Born in St. Catharines Ontario. This self-taught cartoonist, began by sketching cartoons of her friends in humorous situations. Out of this came “Between Friends”. Taking only one commercial art course, she learned to draw cartoons by analyzing them in the newspapers. She began sending samples of “Between Friends” to newspapers in 1986 with few results. She sent one sample to the editor of the St. Catharines Standard. He rejected it but told her to stay in touch after four years, he accepted a revised version. 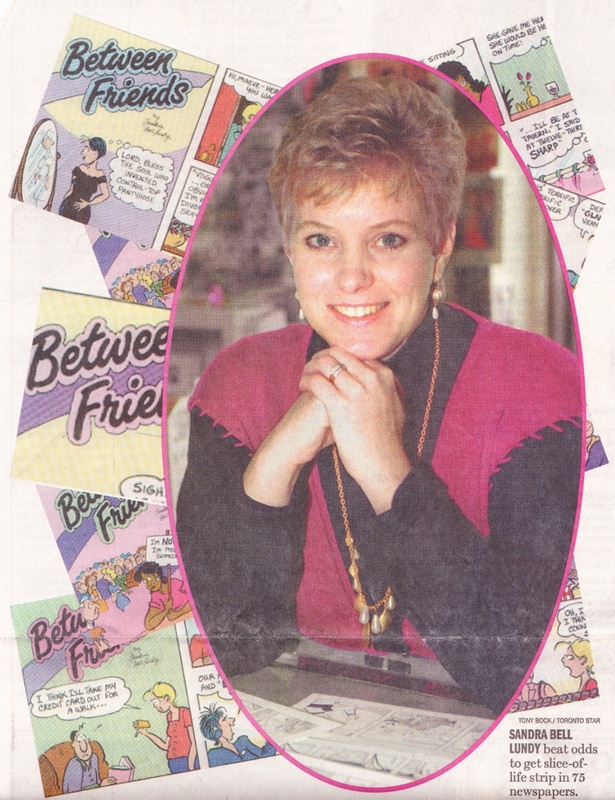 In 1994, her cartoon strip, “Between Friends” was syndicated by King Features Syndicate. In 1995 it appeared in seventy-five newspapers including the Toronto Star, Spectator [Hamilton], Waterloo Regional Record. A collection of the strips appeared as Death of a Saleswoman in 2015. Front: Death of a Saleswoman. Third Life Press, 2015. Death of a Saleswoman. Third Life Press, 2015. “Strip’s inspiration just between friends.” Writ., Nancy White. Toronto Star, 2 Apr. 1995: C1, C9. .
“BETWEEN FRIENDS” by Sandra Bell-Lundy, Death of a Saleswoman: Back cover.